Interested in a one-of-a-kind or special occasion piece? Pearls International encourages creativity, and we’d love to help you visualize the perfect gift for you or someone special. Let us know what you’re thinking and we’ll work with you to create the jewelry of your dreams. Bring your ideas and be amazed at the possibilities! Have a broken clasp, hopelessly tangled necklace, or do your rings just need to be cleaned? Next time you are in Daytona Beach, bring in your trickiest jewelry repairs and they’ll be fixed in a jiffy! We have full service repair capability and prompt turn-around times. Click here to find out more about our comprehensive jewelry repair services. Sometimes it only takes a thorough cleaning to bring old jewelry back to life! 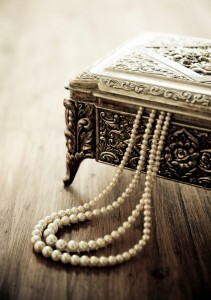 Take that jewelry out of deep storage and let us get it spiffed up and looking its best! In most cases, this service is FREE! Pearls International is a great venue for events like office parties, bridal showers or bachelorette parties, girl’s night out, fashion shows, or fundraisers! We are also available for private personal shopping and consultations. Let us help you plan your special event. There is no charge for having your event at the Pearls International facility – just let us know if we can help by calling 386.767.3473. Pearl Parties by Pearls International! Interested in having a Pearl Party by Pearls International? You can’t go wrong with our Pearl Party Pearl Girls – they are fully bonded and insured, professional and full of fun! Let us know when you would like to schedule a party and we will send you a Pearl Party Packet that will fill you in and give you everything you need to get started! You provide the location, the snacks, and a list of your friends and we take it from there! Feel the need for artistic expression? Our one-of-a-kind Pearls International Creation Station offers a plethora of pearls in a profusion of colors! Just sit down at our beading bench and make yourself at home putting the different pearls, accent beads, clasps, and other pieces/parts together! Then our jeweler will put the whole design together for you professionally! For the price of a few parts, you can have a beautiful set of pearls with matching earrings, bracelet, and ring! Personal Shopping and Style Consultants! Ever wonder what it would be like to be treated like royalty? Here’s your chance to find out with our FREE Personal Shopping and Style Consultations! All you have to do is pick up the phone and call 386.767.3473 to get ahold of our friendly and knowledgeable jewelry stylists. They will ask you a few questions about your signature style and preferences, and then get busy looking for the most appropriate items to fit what you are looking for. It’s fun, and it’s free! As a part of our consultation, we provide a comfortable dressing room where you are welcome to try on your outfit(s) along with the different jewelry pieces to find your most excellent combinations! Just call Pearls International Customer Care at 386.767.3473 or drop us a line at customercare@pearlsinternational.com, and we’ll get back to you as soon as possible!